We took last week off for the Thanksgiving Holiday but are back at it this week...our favorite finds, always in style, always on sale. Tis the Season for sparkles and fur, but it is sometimes hard for me to buy "Holiday" clothing because I know I will only wear it once, maybe twice and then I will tire of it. I love a "Holiday" dress that can be worn for your festive fete now and your Spring Fling later. This sueded, intricately embroidered dress by Parker checks both those boxes. Pair it with snakeskin booties and the rich jewel tones and sueded fabrication make it a cool bohemian option for a Winter event. Or, try it with a neutral platform in the Spring for a stylish nod to the Seventies trend. Everyone by now is aware of my (strong) affinity for Frame Denim, and this pair is no exception. I love the slouchy fit, the perfectly distressed wash and the way that this type of denim makes anything "prim and proper" feel a little less so. I love these jeans with a ribbed henley and supergas. And I really love this jeans with a slinky tank and heels. Try them with the J.Crew leopard gladiators above and a black cashmere turtleneck for the perfect mix of refined and rugged. But them, wash them, roll them, wear them. 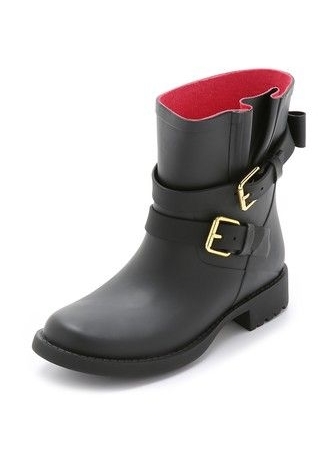 And how about these adorable black moto rain boots? Just because it's raining doesn't mean you have to sacrifice your personal style...and while there are plenty of rain boot options out there, many lean heavily towards the preppy dresser. If that isn't you, then these boots will be a welcome addition to your shoe closet...not to mention they would be a perfect gift (for yourself or someone you love). And then I spotted this Veda jacket that literally oozes cool: The perfect black lamb skin leather paired with an outrageously stylish shearling collar...doesn't get much better. This is one of those jackets that you buy this year and 3 years later will wear just as frequently. It is a fantastic way to add some edge to an ensemble of jeans and a tee and I love the idea of wearing this as a topper for a floral bohemian maxi dress. Priced at 40% off the original price, this jacket is sure to sell out...get your size before it's gone. This top by ATM is one of those tops that once in your line-up, you will wonder what you ever wore before it entered your rotation. A creamy vanilla color, and french terry construction make it classic and wearable while the dropped shoulder and raglan cuffs and hem add edge and interest. I love it styled as pictured with other creamy whites and neutrals, or throw it over a denim button up with your favorite slouchy beanie. It adds a casual element to a tweed skirt and would look fantastic with leather skinnies and high-tops. Lastly, these fringed heels by Joie. Pairing the perfect neutral color with the perfect amount of funk allows them to be on-point without being trendy. I love these with (pretty much everything) but these are showstoppers when worn with rolled "girlfriend" jeans and a leather blazer. Or try them with a long-sleeve maxi dress for a a chic take on the Seventies trend. The padded insole provides added comfort and they are on sale for under $200 with most sizes left. We hope you enjoyed this week's top picks for stylish finds at sale prices. And in other, totally unrelated news...I am OBSESSED with Starbucks new Holiday Spice Flat White drink: espresso with steamed milk that has been infused with cinnamon and cloves. Obsessed. Oh, and if you want Friday Buy Day delivered directly to your inbox you can scroll down and add your email address. Okay, that's it..have a great weekend!